Maps, number lines, shapes, artwork and other materials tend to cover elementary classroom walls. However, too much of a good thing may end up disrupting attention and learning in young children, according to research published in Psychological Science, a journal of the Association for Psychological Science. Psychology researchers Anna V. Fisher, Karrie E. Godwin and Howard Seltman of Carnegie Mellon University looked at whether classroom displays affected children’s ability to maintain focus during instruction and to learn the lesson content. 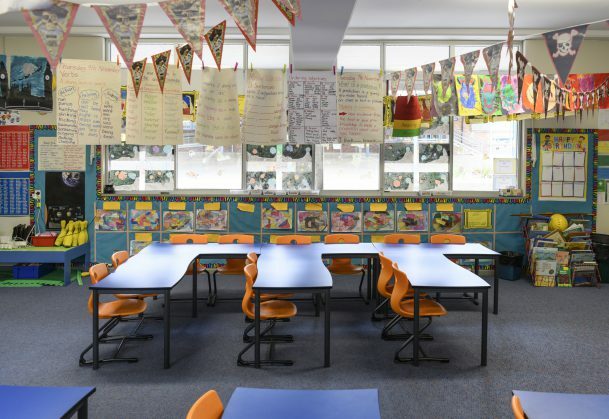 They found that children in highly decorated classrooms were more distracted, spent more time off-task and demonstrated smaller learning gains than when the decorations were removed. “Young children spend a lot of time — usually the whole day — in the same classroom, and we have shown that a classroom’s visual environment can affect how much children learn,” said Fisher, lead author and associate professor of psychology in the Dietrich College of Humanities and Social Sciences. 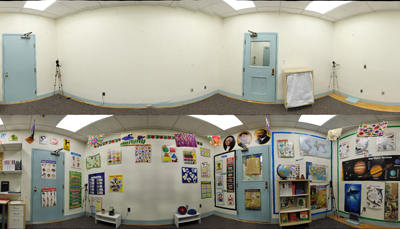 CMU researchers found that children in highly decorated classrooms (bottom image) were more distracted, spent more time off-task and demonstrated smaller learning gains than when the decorations were removed (top image). “We do not suggest by any means that this is the answer to all educational problems. Furthermore, additional research is needed to know what effect the classroom visual environment has on children’s attention and learning in real classrooms,” Fisher said. For the study, 24 kindergarten students were placed in laboratory classrooms for six introductory science lessons on topics they were unfamiliar with. Three lessons were taught in a heavily decorated classroom, and three lessons were given in a sparse classroom. The results showed that while children learned in both classroom types, they learned more when the room was not heavily decorated. Specifically, children’s accuracy on the test questions was higher in the sparse classroom (55% correct) than in the decorated classroom (42% correct). “We were also interested in finding out if the visual displays were removed, whether the children’s attention would shift to another distraction, such as talking to their peers, and if the total amount of time they were distracted would remain the same,” said Godwin, a Ph.D. candidate in psychology and fellow of the Program in Interdisciplinary Education Research (PIER). However, when the researchers tallied all of the time children spent off-task in both types of classrooms, the rate of off-task behavior was higher in the decorated classroom (38.6% time spent off-task) than in the sparse classroom (28.4% time spent off-task). This work was supported by Grant R305A110444 from the Department of Education, Institute of Education Sciences, and by Graduate Training Grant R305B090023, awarded to Carnegie Mellon University by the Department of Education. I just want to know where I can get one of those E shaped tables…. The “E-shaped table” is actually 6 double desks (for 12 students) arranged in an E shape. I have done this on each side of my classroom before, with extra desks in the back, and it’s a very workable, space-efficient configuration. Point taken, but it also depends on the kid. Another challenge, mainstreaming students with a need to be overpraised, whether you agree with it or not, has upped the ante for the whole classroom of kids to announce when they’re “done,” giving teachers an ultimatum has to how they’re going to “entertain” them next. I taught in a 1st Grade classroom for 38 years and I kept a lot of things for informational lessons on a chart stand. (Math, Reading, Science, and Social Studies Info. was turned to what we needed.) I did have a regular calendar, number line, short and long vowel posters up at all times. I also had a running word wall. My art work hung in the hallway for all to see. The kids loved showing off their art to parents,and friends. I believe too much is distracting to students. I also highly believe in reading with the actual books, and the kids sitting comfortable on the carpet around you. I had a Smart board for lessons too, but I would never have it read all my beloved stories. Help kids work in less distracting rooms for those lessons like math, reading, science, and social studies. Yes, you will have noise and distractions for art, music, and games. These are meant to be interactive with a lot of movement and talking. Have fun teaching to the new wave of teachers. I noticed this 15 years ago when, as a teacher advisor, I took 12 teachers on exchange visit to Prague for a teaching and learning research project.They had much more ‘space’on their display walls, giving the brain time to process the ideas and information. 1) Are the three lessons in each classroom sufficient? 2) Was this experiment repeated for a long period of time (3 months in each classroom)? 3) Are 24 students statistically sufficient? 4) Was this experiment repeated in other classrooms in different schools? 3- Do the children know each other from before? if yes, did they change seating from what they are used to in their regular classroom? 4- what about the lessons themselves? do we have any statistical data on the average accuracy on the test questions for those specific lessons among children same age? Those are truly great questions. Too often we (those in education) tend to hear of research and take it as gospel. I believe that there is definitely a need to look at distractions such as those mentioned in the article, but a larger number of students is necessary. ‘decorated’ walls? This distracted learning still occurs and is hoped for in the wall’s stimulating displays. I have visited schools throughout Europe, S. America, and Asia (China, S. Korea, Singapore). When contrasting the architectual care and beauty, the grounds and gardens, and the classrooms in the schools there with those here, it is shocking. In contrast, American classrooms (particularly elementary amd grade school) are shabby and the decorations excessive, tacky, and garish. Even without a scientific study, it is easy to know what truly inspires higher learning —a neat, clean, architectually harmonious space and a talented teacher. Thank you for publishing this needed article. Should we also remove the windows as well? I agree that rooms should not be over decorated to the point where they appear busy and cluttered. More focus needs to be put into providing relevant stimuli that encourages children to become engaged in the topic at hand. Removing stimulation can lead to sedating our children so they can do busy work or administration essentially. The balance is difficult and compounded so by the variability encountered with diversity of children in a classroom. Don’t over clutter to the point of distraction but don’t sterilise the learning environment either. What about the impact on their mental health from being educated in classrooms that resemble prisons? Schools do not just hold responsibility for drilling as much information into children as possible – they also have to ensure they are helping to raise happy, healthy children and spending 6 hours a day in a dull unenriching environment is not going to be beneficial to the child’s overall wellbeing. I would rather my child learnt a little less and was getting a richer holistic experience rather. The things on a JP wall are often things young children can reference to, to support their early spelling and reading and numeracy while those that are hung are usually the children’s work giving them affirmation of the efforts they have made in completing work. They are always so proud to show their work on display. I also find a really stark appearances can look depressing and like no one cares. Why are kids on average only getting 55% of the test answers correct even in the sparcely decorated rooms? Do most of these kids get 55% correct or is there a broad range of scores? Can you tell if the same individuals got more correct answers in the sparce room than in the mire highly decorated room or is it a few affecting the mean score? I grew up in Czechoslovakia in 80’s and we had blank walls in class. maybe a map here and there or picture of historic figure. Musicians I think. and big windows. lol. When I came to USA I couldn’t believe the amount of stuff they can squeeze in here into classroom! Not just charts, shapes, abcs on the wall… but paint supplies… everything out on display. I feel like I am having stroke from seeing it all and I am an adult imagine seeing it as child. This was one of the reasons’ why we looked for private school where there is space for mind to calm. I know it’s hard but classes do not have to be overstuffed like most I have seen! Whilst I do agree that swirly carpets and busy walls can be over-stimulating I disagreed with the concept of ‘distracted’. We should be entering a time where students are engaged in group tasks or independent learning and not sat in a stark, emotionless space to focus on the teacher. Young children will soon stop wanting to come to a stark environment as it will not feel safe and secure. Environments are key but children need to feel ‘at home’ and they need to have familiar objects in their space. I enjoy working in my office because it is gently personalised to suit me. A simple declutter is fine and also the addition of house plants and plain carpets help to balance out an environment. Interesting study. My thoughts about this: I wonder how a fairly empty room to start and students add charts/artwork/information as they study things would help them feel more in control of their “distractions” than if a teacher is the one controlling what goes on the walls/ceiling? Over-stimulating kids is a concern for me especially in overcrowded classrooms. KLM, the idea of students decorating the walls with what they’ve learned would be fascinating to see. Mal Reynolds, your introductory question is a reality in Las Vegas. Classrooms here have either no windows or a few small windows at ceiling level, far too high for anyone to see out of. I have spent the last 24 years with the only view being four walls and a door.